Dr. Adam Zucker, with his brown hair and long beard, is often mistaken for William Shakespeare himself. This is fitting, as he is Associate Professor in the English Department at UMass Amherst with a focus on Elizabethan Theatre. We were lucky enough to host Dr. Zucker in the Williston Theatre on Wednesday to discuss The Comedy of Errors with the cast of our production. For the outside observer, comedy seems like a chaotic and rambunctious art form. Rambunctious, yes. Chaotic, no. There are meticulous rules to comedy, much more so than drama, that are in place so that our audiences believe in the chaos that the characters are living through. The first rule is “Yes, and…” For those readers not familiar with improv (a genre of performing where players make up a scene as they go along), this means that when your partner adds something to a scene you agree with them and add something new. This rule is critical because it communicates to all players that collaboration is essential to good improv. No one is more important than the other. This rule is followed by play the truth of the scene, play at the top of your intelligence, and, one of my personal favorites, keep the stakes high. This structure gives comedians a framework in which to create their best work. 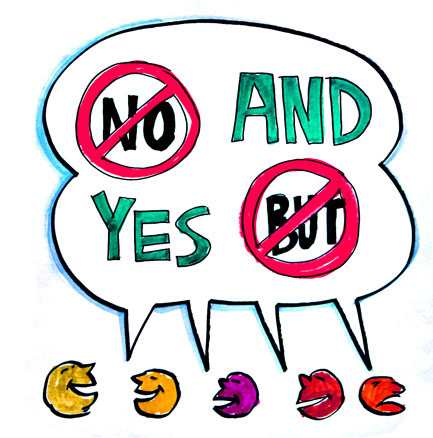 Saying “No, and…” or “Yes, but…” is a sure-fire way to kill a scene and also communicates to your scene partner that you are more important than they are. The Comedy of Errors was long thought to be Shakespeare’s first play. It is by far his shortest play with what, at first glance, seems like a very simple plot. All the evidence pointed to the fact that he was a new playwright who hadn’t developed fully as writer. However, scholars have since discovered that Comedy was first performed around 1594 (still early on in his career) at the hall of Gray’s Inn likely during Christmastime for an audience of nobleman and royalty. The play’s brevity is due to the fact that it was an after piece– a short, boisterous comedy that completed a night of fun and merry-making typical of the Elizabethan holiday season. The play was inspired by the great Italian Comedy of the Renaissance (commedia dell’arte) and the Roman comedies of Plautus. Anyone who has spent any time in the Williston Theatre knows that I love commedia dell’arte, the professional theatre troupes that grew out of the Renaissance. Almost all of the comedy we see today is derived, in one way or another, from commedia. These troupes were well-organized and often had women in charge (something that, even now, is a rarity in professional theatre). They roamed the countryside of Europe, creatively subverting the status quo by using improvisation, familiar stock characters, gibberish and broad comedy. Like today’s best stand-up comedians and sketch comedy artists, commedia poked fun at all of the things that were wrong with society. Audiences loved it, the government and the Catholic church did not. An artitsts’ rendering of a commedia troupe performing in a town square. Because commedia is the basis for all Western comedy (especially Shakespeare’s comedies, which were heavily influenced by commedia), I invited local commedia expert Brianna Sloane to lead a physical comedy workshop with the cast of The Comedy of Errors. Ms. Sloane is the artistic director of Theatre Truck, which crafts “mobile and site-specific theatre sustainably and playfully.” Her current piece, The Water Project, is an interactive and immersive piece about the communities that were flooded to create the Quabbin Reservoir and will be performed at the Swift RIver Historical society later this month. She has studied commedia dell’arte at the Accedemia dell’Arte in Florence, Italy and holds an MFA in Directing from UMass Amherst. Her vibrant energy kept our actors engaged for the duration of the two-hour workshop! After a terrific warm-up that involved lots of moving and shouting (like any good theatre warm up! ), our actors got a chance to explore the major stock characters of commedia one at a time. Starting with the Zanni (the lowest of the servants who are struggling for basic survival) and all the way up to the Lovers, the cast could make connections between their characters and their commedia counterparts. The Comedy of Errors is incredibly physical. Without a basis to create the bodies of our characters, we would end up with a play that is boring and doesn’t stay true to Shakespeare’s intentions. We look forward to applying all of the wonderful and wacky things we learned in our workshop to the rehearsal process as we bring the show to life. When you come see the play, try and see which commedia character influenced each actor! See below to learn more about some of the stock characters of commedia. Arlechino, one of the most famous characters in commedia, is a servant trying to survive. With his wily imagination he gets himself in and out of heaps of trouble. He is pictured here with the slapstick that his master, no doubt, will beat him with for messing up one task or another. Columbina is a strong, witty, servant who knows more than anyone in the play. 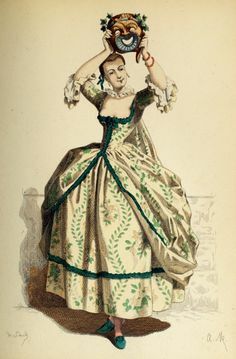 She is often the object of Arlechino’s affections. 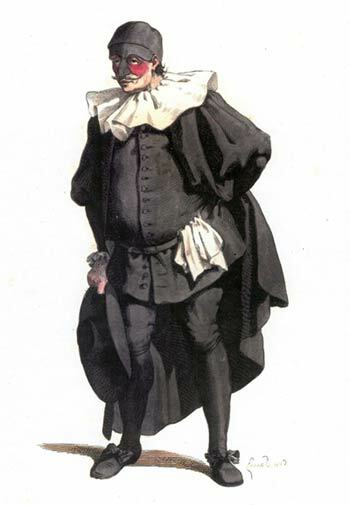 Pantalone is also very well known and is the basis for lots of contemporary comedy (think Mr. Burns from The Simpsons). He is an old man with lots of money that he doesn’t want to lose. Most of his plots revolve around trying to marry off his daughter so he can make even more money. Pantalone’s female counterpart, El Strega, is nearly forgotten. An old witch with magical powers, her distant relatives can be seen in fairy tales like Snow White. Il Dottore is Pantalone’s nemesis. A doctor who knows virtually nothing and speaks nonsense, he is usually the father to the son of whomever Pantalone is trying to marry his daughter. Perhaps my favorite character in commedia, Capitano brags of having done the most brave and terrifying things in battle, but when push comes to shove he is afraid of everything. All characters in commedia posses some kind of duality along these lines. The lovers, central to all commedia plots, are obsessed with themselves only slightly more than their love-interests. Tickets for The Comedy of Errors will go on sale in early October. Visit http://williston.com/theater for more information. School is back in session and the theatre building is already teeming with life. Lots of students, old and new, have excitedly found their way back to the studio theatre inquiring about auditions for the fall play (which are TONIGHT– we waste no time here!). It seems fitting then, for us to announce the season to a broader audience so you can get as excited as we are. Without further ado, here are the plays for the 2016-2017 school year! To celebrate the 400th Anniversary of Shakespeare’s death, Williston is producing one of the Bard’s most outlandish and ridiculous works. The Comedy of Errors is a raucous and hilarious play that follows two sets of twins who were separated at birth in a sea-storm. Antipholus of Syracuse and his servant, Dromio of Syracuse, arrive in Ephesus, which turns out to be the home of their long-lost twin brothers, Antipholus of Ephesus and his servant, Dromio of Ephesus. When the Syracusans encounter the friends and families of their twins, a series of wild mishaps based on mistaken identities leads to a near-seduction, arrests, and accusations of infidelity, theft, madness, and demonic possession. Inspired by both the Roman humorist Plautus, and commedia dell’arte of the Italian Renaissance, The Comedy of Errors is truly comedy at its best. In light of this, we are planning special collaborations with our Latin and AP European History students, so stay tuned for more info about that! October at 27 and 29th at 7:30pm, October at 28th at 8pm. Join us for a talk-back after the show on Thursday October 27th. The performance on October 28th is free for Williston Families. Have you ever wondered what happens when you ask a bunch of theatre students to collaborate on a series of one-act plays? Well, it’s pretty fabulous and we call that THEATRE LAB. Students direct, act, design, and stage manage four short plays which gives them a 360 degree look at what goes into theatre-making. Look out for an exciting new twist this year and the names of our four directors! Based on the popular novel by Dave Barry and Ridley Pearson, Peter and the Starcatcher follows the adventures of a nameless orphan and his new-found friend Molly Aster as they keep a secret treasure safe and out of the hands of the pirate-villain Black Stache. Set on the high seas and a remote island, Peter and the Starcatcher takes its audiences on a magical adventure as we meet lords, orphans, mermaids, sea creatures, and pirates. The story, which serves as a prequel to J.M. Barrie’s novel Peter and Wendy, is theatre magic at its best and guaranteed to touch the hearts of audiences ages 9-99. April 27-29 and May 4-6 at 7:30pm. Please join us for a talk-back with our cast and crew on Friday April 28th. That evening’s performance is also free for Williston Families. For ticket information for these productions visit www.williston.com/theater. Tickets will go on sale approximately four weeks before opening. At this morning’s assembly Archivist Rick Teller explained the word “commencement.” It’s a strange word, considering it is, in fact, the ceremony that marks the end of ones school career. But, as he said, it also marks the beginning of the rest of the graduates’ lives. Our graduates are about to embark on new, uncharted territory and have thrilling new adventures. They are curious to see what the future holds. Theater students will get a glimpse of what that this future might look when two alums visit campus this Thursday. If you happened to set foot in the Williston Theatre between 2011 and 2014 the names Oliver and Ben will be familiar to you. 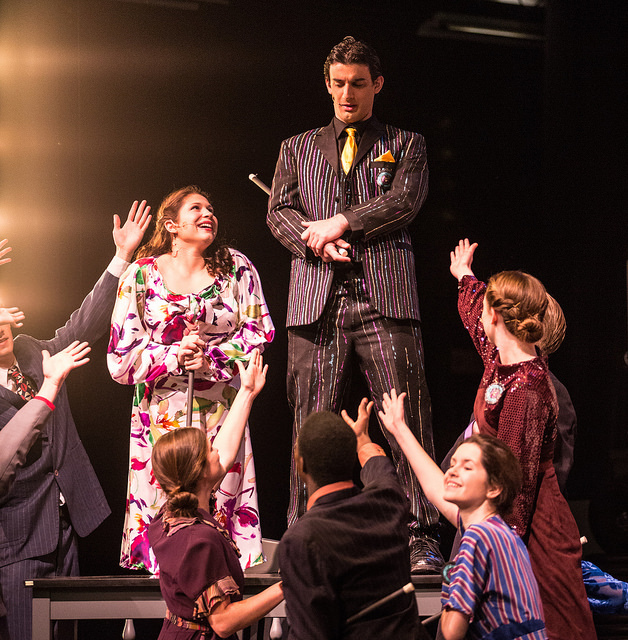 Both graduates of the Williston class of 2014, Ben Sarat and Oliver Demers delighted audiences onstage in plays like Rumors, The Servant of Two Masters, and Urinetown. Both skilled comedians, their senior project, a combination of live improv and filmed sketch-comedy, played to a sold-out house. 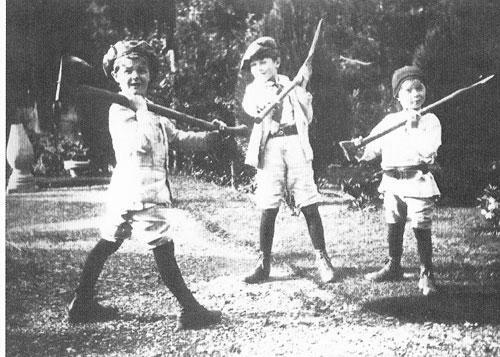 Ben and Oliver were more than skilled performers. Like many of our theatre students, Ben and Oliver were role models. Our younger actors and designers (now seniors themselves!) wanted to be just like them. From Ben and Oliver these younger students learned about the dedication it takes to do theatre and how critical it is to set up a welcoming and safe environment for everyone. 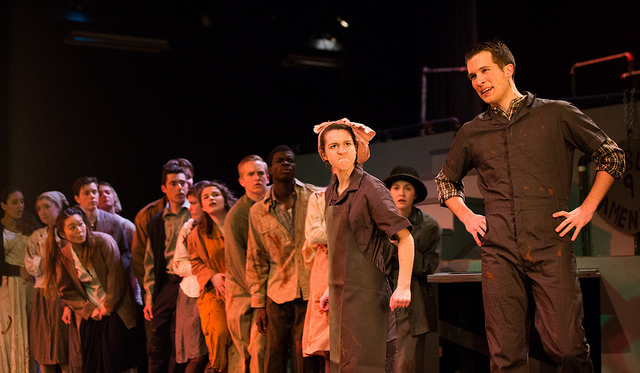 Ben as Caldwell B. Cladwell with the company of Urinetown, Spring 2014. It is no surprise that Ben and Oliver went off to do some pretty exciting stuff at college. Both rising college juniors now studying theatre, Oliver has already performed off-off Broadway and Ben’s college improv team, The Dimple Divers, won the top prize at ImprovBoston’s College Comedy Festival. They’ve both studied at the Upright Citizen’s Brigade and other legendary comedy institutions. You can imagine my delight when they expressed interest in coming back to share what they’ve learned with current Williston students. It’s safe to say that their expertise has now outpaced mine! The two will be returning to campus tomorrow, Thursday May 26th from 3-4 in the Studio Theatre, to lead an improv masterclass with our current students. We invite anyone who has taken a theatre class at Williston to join us for an afternoon of true hilarity. Be prepared to try some new improv games and learn new tricks of the comedy game. I can’t wait to see what Ben and Oliver have up their sleeves. If you have any questions please don’t hesitate to get in touch with me at editkovski@williston.com.